3PK495 BANDO Automotive Micro-V Belt. Replaces Gates K030195, Dayco 5030195, Jobber 195K3. Home > Automotive Belts > Automotive Serpentine Belts. 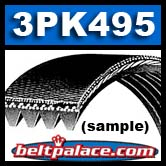 PK, K Section Poly V > 3PK495 BANDO Automotive Micro-V Belt. Replaces Gates K030195, Dayco 5030195, Jobber 195K3. Fits select SUZUKI Sidekick/Grand Vitara/Vitara/Vitara-Cabiro Models: 1714477 - 1714477E00 - 17144-77E00. CHEVY Tracker (2000-2003): 3PK495, 195K3.